Regular duties are suspended for three days at Fort Campbell, which leads the Army in suicides this year, so commanders can identify and help soldiers who are struggling with the stress of war and most at risk for killing themselves. The post began a stand down on Wednesday so soldiers can focus on suicide prevention training in the wake of 11 confirmed suicides by Fort Campbell soldiers this year. More deaths are being investigated as possible suicides. "This is not a place where Fort Campbell and the 101st Airborne Division want to be," said Brig. Gen. Stephen Townsend. "We don't want to lead the Army in this statistic." From January to March, the installation on the Kentucky-Tennessee line averaged one suicide per week, Townsend said. After an Army-wide suicide prevention campaign in started in March, there were no suicides for six weeks, he said. "But last week we had two. Two in a week," Townsend said. In a series of addresses this week, Townsend will speak to each of the approximately 25,000 soldiers assigned to the division. 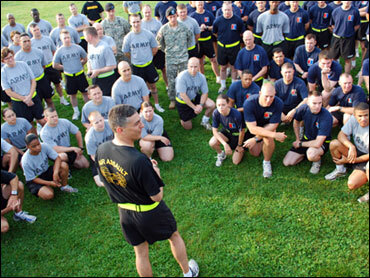 He told more than 4,000 soldiers Wednesday morning that the suicides must stop. "Someone here has had thoughts or is having thoughts about hurting themselves," Townsend said. "Or you know someone who is." Army leaders have been developing new guidance for commanders to help installations like Fort Campbell deal with rising suicide rates. Across the Army, suicides from January through March rose to a reported 56 - 22 confirmed and 34 still being investigated and pending confirmation. The Army has said that soldier suicides reached the highest rate on record in 2008. Officials said the deaths in 2008 would amount to a rate of 20.2 per 100,000 soldiers, which is higher than the civilian rate, when adjusted to reflect the Army's younger and male-heavy demographics. Frequent deployments by the division since 2001 have contributed to the stress suffered by soldiers at Fort Campbell, said Col. Ken Brown, the head of chaplains on the installation. "We've been at war at this installation for seven years," Brown said. "I think that has a cumulative effect across the force." Fort Campbell leaders have asked soldiers on the post to look out for each other and paired them up through a "battle buddy" system. Unit leaders are also reviewing and updating lists of soldiers who may be a risk for suicide and are reminding them they can seek help from resources such as a chaplain or a hospital. But Army officials say many soldiers are afraid that seeking help for mental health issues will hurt their career or make them appear weak to their fellow soldiers. Townsend urged soldiers to speak up. "You wouldn't hesitate to seek medical attention for a physical wound or injury," Townsend said. "Don't hesitate to seek medical attention for a psychological injury."